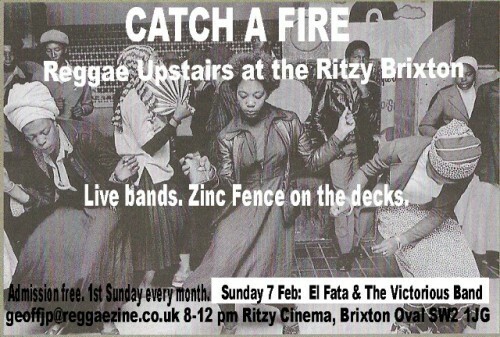 For over 3 years, on the first Sunday every month, Catch A Fire has brought the best in reggae on the decks with the best live reggae acts around to Upstairs at the Ritzy in the heart of Brixton. After a major refurbishment, Upstairs at the Ritzy offers more space than ever for music lovers, with the sound system broadcasting loud and clear on two levels. Sunday February 7th presents El Fata with the Victorious Band, featuring Winston on Drums, Jerry Lion on bass guitar, Spike on keyboards, Mark on rhythm guitar. Zinc Fence on the decks, serving up the best in Jamaican music from ska to dancehall. Expect top tunes in celebration of the Right Honourable Robert Nesta Marley’s birthday weekend, including Good Good Rudie, Thank You Lord, and Lick Samba. Special 8 p.m. PA from Kingman, conscious roots singer & lyricist.